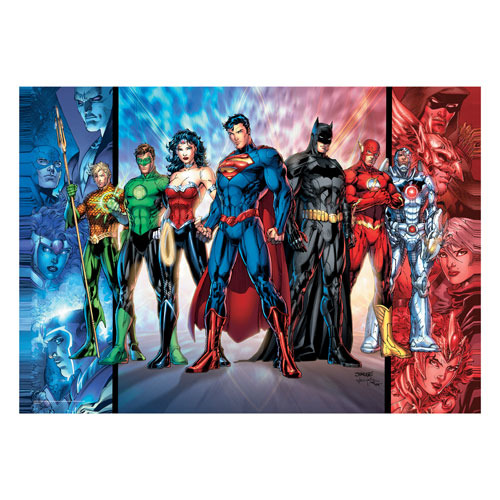 The Justice League stands ready to defend the world in this unique DC Comics Justice League MightyPrint Wall Art. Durable and tear resistant, this unframed 24-inch tall x 17-inch wide state-of-the-art opaque print of Wonder Woman, Superman, Batman, Flash, and more features sharp, crisp, vivid colors; a matte finish that's fade resistant; and light diffusing properties. Add it to your DC Comics collection today! What makes MightyPrint wall art so unique? MightyPrints are made to last. Due to the prints' high quality and durability, you won't have the typical difficulties of tearing, fading, or warping. These prints are vibrant in color, making them a welcome addition to any collection. In addition, MightyPrints are made to diffuse light, bringing the colors to a new level when back lighting is present. Place yours in front of a window or in an illuminated light box (sold separately).